Welcome to Day #3 of Christmas Week, a multi-blogger event co-hosted by Kim of Cravings of a Lunatic and Jen from Juanita’s Cocina! Each day we will be celebrating the holidays with a different set of Christmas-themed treats, as well as a fabulous Christmas giveaway. We hope you enjoy this fabulous event. Tune in each day starting today, Monday, December 9th and ending Saturday, December 14th. I thought it would be slightly appropriate to offer a Jewish cookie during a week long of #Christmasweek treats. I know Hanukkah is over, but I just can’t stop myself from creating rugelach recipes! I think this is what..my 3’rd take on flavor combination with rugelach and I am still hot and going! 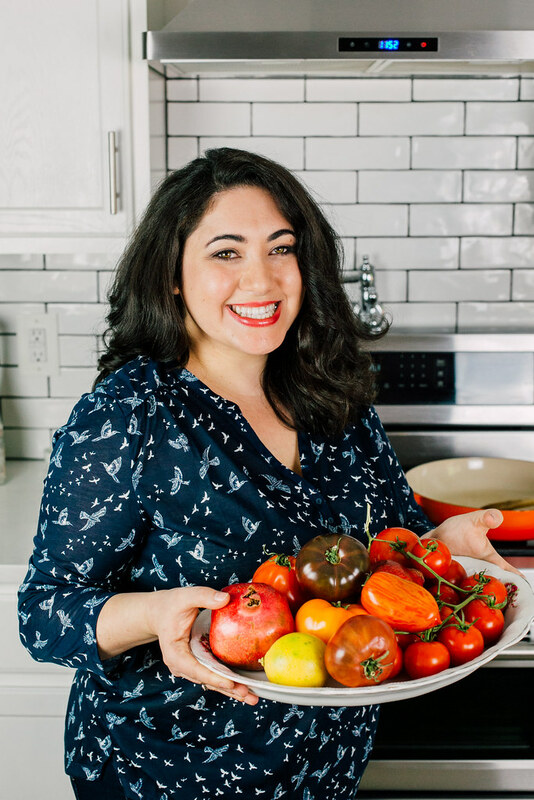 I have crazy ideas in my head like coconut and pineapple, or a savory rugelach with fresh herbs and a decadent cheese or maybe a take on the classic New York everything bagel?! Ahh…I love rugelach. 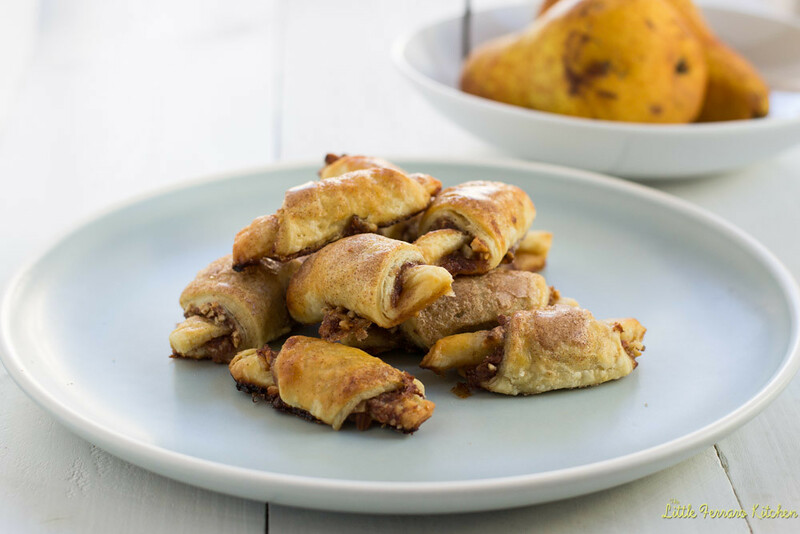 The idea of pear rugelach came to me when I made poached pears the other night. There is really nothing better on a wintery evening then the smell of slowly poaching pears in deep cinnamon flavors and red wine. So I thought..why not make it into a cookie!? The result was almost what I hoped for. When you poach pears, you can either leave them slightly firm, or if you’re like me and decided to use overly ripe pears, your poach pears can get very soft very quickly. So my initial thought of having small pieces of bite-sized pear floating in-between the layers of dough didn’t exactly happen as I hoped. However, not all is lost! Instead, I strained the soft pear from the wine and lightly mashed it with a fork. I used this as my fruit layer, which was beautiful. 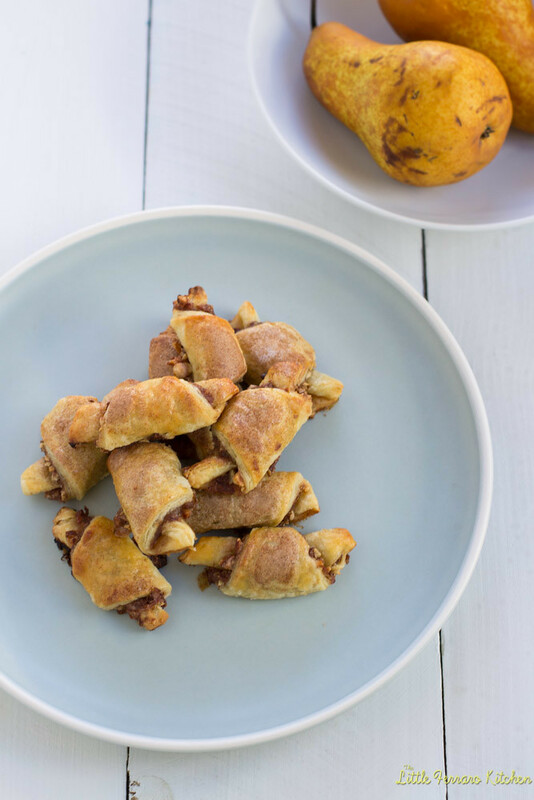 And of course, rugelach is known to have a fruit and nut combination, so lightly toasted almonds paired up perfectly to offer a smokey crunch to the wine soaked fruit. And before I forget…all the glorious wine that the fruit and cinnamon and orange has been slowly soaking in…keep save! That is amazing as an after dinner drink with your freshly made rugelach! In a small pot, add all the poaching ingredients together and allow to cook on a low boil. Cook until the pears are fork tender. (Note* to get strips of orange, use a vegetable peeler to peel of the skin of the orange and use about 3 for this recipe). When done, remove the pears from the wine and lightly mash with a fork. Strain any leftover wine and reserve the pear. Keep wine for another use. To make the dough, cream the butter and cream cheese using a stand mixer with a paddle attachment until well combined and light and fluffy. Add sugar, salt, vanilla and mix well. Then on low speed, slowly add in the flour until well combined. Form dough into a ball and cut into quarters. Wrap each dough ball in plastic wrap and refrigerate for 30 minutes. Meanwhile, in a separate bowl, mix together the rugelach nut mixture. Take 1 dough ball out and on a floured surface roll out dough to 9-10 inches round. Use a round plate (about 9 in.) to cut and make an even circle. Save excess dough scraps to re-roll. (All the left over scraps will be enough to roll out for another 8 rugelach). Take 2 Tb of pear mixture and spread it evenly onto the dough. Take 2 Tb of nut mixture and sprinkle it evenly over the pear. Use a sharp knife or pizza cutter to cut in into 8ths and roll each wedge from the outside-in. 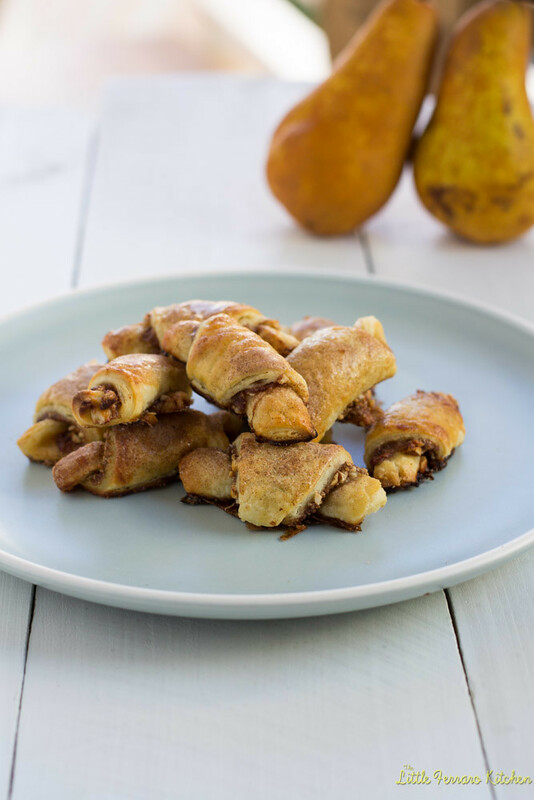 You can see step by step instructions on how to roll rugelach here. Place all rugelach, point side down on a non-stick baking sheet and brush with egg wash and sprinkle with cinnamon sugar. Bake at 350 degrees F for 15-18 minutes or until rugelach begin to get golden brown. Today’s #ChristmasWeek giveaway comes courtesy of Freund Container & Supply. Freund Container & Supply has been helping build businesses since 1938 as the largest distributor of glass bottles, containers, and wholesale packaging supplies online. Freund offers over 5,000 items in stock every day, 98% same day shipping, and low-price guarantees. Take a look at Freund’s wide selection of jars, tins, bottles and vials for all your crafting and food related needs! To enter to win one of FIVE different Freund gift certificates, read the details and use the Rafflecopter below! You are like the rugelach queen! LOVE these! Jen @JuanitasCocina recently posted..#ChristmasWeek Day 3 with a #Freund Gift Certificate #Giveaway! Brilliant idea with the poached pear flavors in your cookies. Love all the ingredients you choose they all compliment each other so well and that’s why this goes into my recipebox. I would buy the glass corked honey pot jars. I’ve never tried rugelach before. I can pretty much guarantee I’d love them! I love little sweets like this and I have never made anything like this!! If it was on a cookie tray that would be the first to grab!! YUM!! Tara!!!! You’ve never had rugelach??? Hmm..how much does it cost to mail to Canada?? lol You MUSt make rugelach!!! These beautiful cookies and a small sipping glass of pear flavored wine? I am IN! I agree Stacy! Thank you for your lovely comment! I would get the corked honey pot jars- don’t ever stop dreaming of new rugelach flavors!! The best! Picture perfect rugelach! And your filling sounds incredible!!! These are so elegant. I just love these Samantha. You brought your a-game lady. So happy you are part of Christmas Week.